Commercial laptops computers are ideal for home and office use; they are inexpensive, lightweight, portable and easy to use. Unfortunately these same factors limit a laptop’s effectiveness out in the field where they can be subjected to adverse conditions and damage from falls as well as exposure to extreme temperatures and humidity.So what do you do if you need a laptop computer that can function under conditions that would probably destroy an average commercial laptop computer? You need s rugged laptop! “Rugged” laptops are laptop computers that have been designed and constructed to function under the most extreme of conditions. This “ruggedness” – the computer’s resistance to damage – includes not only the computer’s external housing but also its internal components as well. WHAT MAKES A LAPTOP A RUGGED LAPTOP? Rugged laptop computer manufacturers try to eliminate the structural and operational vulnerabilities present in commercial models. For instance, the chassis of a rugged laptop is usually made from metal, not plastic. A padded “skin” is often present to serve as a shock absorber. To protect the computer from the elements, rugged laptops have features like rubber sheeting under the keyboard keys, sealed port and connector covers, and passive cooling systems. Their super bright displays are easy to read in the harshest of sunlight.Major components like the Hard Disc Drive, LCD, Motherboard, and RAM are shock mounted to prevent damage from falls and vibrations. Their batteries supply power for 12-15 hours. Even the cases are reinforced, often made from the same metal alloy as the laptop’s frame. To be classified as a “rugged” laptop the computer is subjected to a number of tests that determine how well the computer and its components handleunder specific environmental conditions. Usually the rugged laptop computer must meet the standards specified by the MIL-STD-810F/G as issued by the United State Army’s Developmental Test Command.The MIL-STD-801G consists of 24 teststhat establish, among other things, how well the computer handles humidity, low temperatures, high temperatures, vibration,altitude, ballistic shock, dust, and extreme temperatures. Another important standard is a laptop’sIngress Protection, or IP, rating,as defined by international standard IEC 60529. The IP rating is used to specify the level of environmental protection of electrical equipment against solids and liquids. A rugged laptop’s IP rating is displayed as a 2 digit number. The first digit reflects the level of protection against dust while the second digit reflects the level of protection against liquids. For dust, protection is decided by how effective the laptop is at keeping out particles of various sizes and weights; it ranges from 0, or no protection, to 6, which means total protection against dust.Water resistance is measured by the amount of water it takes to penetrate the laptop’s exterior casing; it ranges from 0, or no protection, through 8, which is total submersion under pressure. WHO USES A RUGGED LAPTOP? Who uses a rugged laptop? In addition to their obvious military applications, ruggedized mobile computing devices play an important part in a wide variety of professions, including: aviation, engineering, manufacturing and construction industries, the government and law enforcement agencies, site inspectors, field researchers, and utility companies. There are three main classifications of rugged computers: business rugged, semi-rugged, andfully rugged. “Business” rugged is adequate if the main concern is protection against accidents like from falls or spills (not submersion). They are ideal for office, travel and warehouse use. If you intend to use your computer out in an environment where anything can happen, you’ll probably want to go with a fully-rugged model. Semi-rugged laptops usually come equipped with metal casings, shock mounted hard disk drives and a water resistant keyboard. Semi-rugged laptops are often found in repair shops.Unlike fully rugged laptops they are not fully-sealed against water and other elements in the outdoor environment. In addition to the features mentioned above, a fully rugged computer is sealed to keep out the rain, salt spray, wind, dust, sand, and humidity. They have special heating and cooling systems to prevent the sealed computer from overheating or freezing. Fully-rugged laptops also have screens that can be viewed under the harshest of daylightand often have illuminated keyboards for use in low light conditions. Some of the leading manufacturers of rugged laptop computers include GETAC, Panasonic, GammaTech, General Dynamics/Itronix Corporation and Motorola. 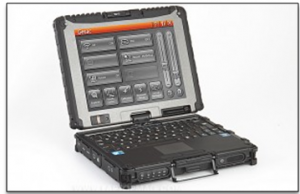 In addition to rugged laptops, there are also rugged tablets and rugged handheld PDAs. Rugged isn’t cheap. A fully rugged laptop computer costs quite a bit more than a regular commercial laptop computer. But if you need a laptop computer that will keep working under the harshest of conditions, then a rugged laptop computer is the way to go. Jeff Vance is an internet content specialist working for Laptop Screen Source.com.au, an Australian company that sells OEM replacement laptop and iPad digitizer screens.